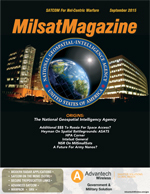 By Garr R. Stephenson, Jr., Head of the Airborne Comms-On-The-Move (COTM) Business Unit, UltiSat, Inc.
During 2015, SATCOM Beyond-Line-Of-Sight (BLOS) continues to emerge as a crucial element for today’s missions, from what used to be known as basic service to one that now encompasses growing user requirements and increased capabilities. Absolutely essential is the need to combine real-time mobility operations and reach-back communications for warfighters and government users around the globe, allowing them to share mission-critical applications and information. The challenge of meeting these needs, while maintaining, and even enhancing, defense capability in critical areas to counter unforeseeable asymmetric and conventional warfare threat environments, has not decreased and will not do so, at least for the foreseeable future. Airborne Intelligence, Surveillance and Reconnaissance (ISR) applications have become among the most important asset for supporting military operations. This has occurred due to the increased pressures regarding the tasking of improved situational awareness for military personnel, with warfighter protection extended into smaller, and additional, expeditionary locations. In less than a decade, the relevance and reliance on MILSATCOM for delivering these high value ISR applications’ information has become one of the primary requirements in concept of operation tactical planning. The ability to deliver all ISR application and sensor data over large areas of the world, with little to no latency, is not only a staple now but also a “must-have” capability—from what used to be a desire is now a demand. Solution providers are asked to deliver high data rate applications over an IP network via satellite communications, with the connection being secure as well as persistent. Couple these demands with the pivot to unmanned platforms and the multiple variations in the payloads available on Unmanned Aircraft Systems’ (UAS) platforms and a complex problem is presented for comms implementation. Regardless of the wide range of sizes and shapes of UAS platforms, there remains the expectation that MILSATCOM systems will perform identically across all platforms. Simply put, there is no single, “square peg” for all of these “round holes.” The solution resides in flexible, open systems architectures that can be integrated seamlessly into current platforms. These solutions have to perform far more reliably than any closed, vertically integrated solutions can do, all the while meeting the varying convolutions of various systems integration required by the wide array of airborne assets that are available today. At one time, military and commercial organizations had to select solutions based on a vertical or horizontal integration approach. Today, technologies are based primarily on commercial, open architectures, which do provide an advantage in retrieving maximum performance from Airborne Communications, without limiting the ability to address future requirements and changes. Commercial organizations are continuing to advance Commercial-Off-The-Shelf (COTS) technology at an expedited rate and, for the first time, are able to exceed the increasing demands for higher data rate applications, such as Full Motion Video (FMV). Previous product generations could only select from a handful of closed, vertically integrated options. The multiple options that are available today offer the highest value to the end-user through increased performance at a lower cost and the ability to scale or adapt to changing requirements. There are multiple modem and antenna systems available that are able to interface with one another to provide true, best of breed capabilities. Customers should no longer be forced to select from limited, packaged offerings—they should now insist and demand flexible solutions that will adapt with the warfighters needed requirements and, over time, continue to evolve and migrate to even more capable systems. Through the elimination of complex, resource-intensive, proprietary systems, end-users no longer need to be concerned that as soon as a capability is deployed, the technology is no longer able to support comms demands. Commercial systems provide the leverage necessary to remain ahead of the latest advances without any concessions regarding economics, security, or performance. Garr R. Stephenson, Jr. heads up the Airborne Comms-On-The-Move (COTM) business unit at UltiSat, Inc. UltiSat is a leader in global SATCOM and managed network services and provides innovative strategies for the growing demand of airborne applications, without compromise for security, scalability, and flexibility. UltiSat currently supports Airborne COTM networks on manned Fixed Wing and UAV Programs for domestic and international customers.